A few days ago I had the fortune to be invited to an exciting project, a secret compost pile in the Halifax rail cut. It seems neigbourhood residents who can't or don't want to compost at home bring their organics here, as well as several landscaping companies who would rather not pay to haul lawn trimmings. Perhaps some of these people live in apartment buildings, which when they are over a certain number of residents are not legally obligated to provide composting services. 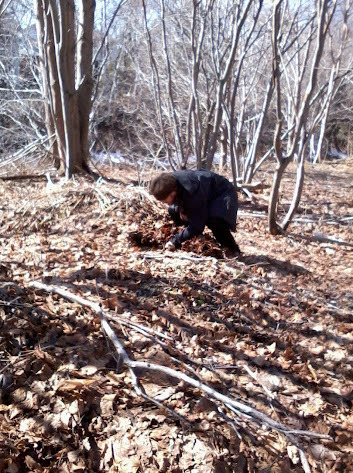 A friend who shall remain anonymous checks on the compost at an undisclosed location. The finished goods, ready to go back to the trees of the railcut. Neigbourhood regional composting stations provide a necessary service to people who can't compost at home and who want to reap the benefit of nutritious finished soil for their gardens. They also save the gasoline that would be converted to greenhouse gasses shipping organics to city facilities. In an ideal world these could be out in the open, occupying a corner of city land such as in a public park, in attractive well build and rodent resistent boxes. It's a tough call to say whether these piles should be more vermin proof or not. Doubtless if someone built a couple of nice boxes in the railcut the clandestine nature of the pile would be removed and all manner of fits would be thrown to have them removed. I hope more discussion on central community composting can be started. 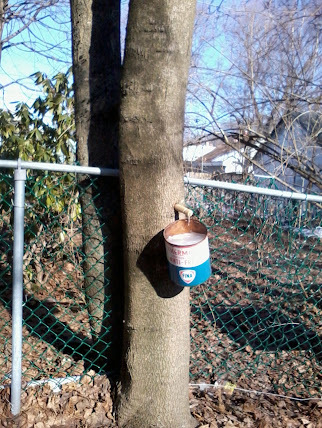 On my way home I also saw my first evidence of urban maple tapping. Maybe two years ago, buckets and spiles showed up beneath maples on Allan street. The CBC tried to find out who was tapping but never got answers. If you know who the tappers were, I'll ask you to keep mum about it here as well because it remains illegal to do any urban food production in the city, including tapping the city's trees. I'm not sure I would use a paint-thinner can though. I hope they washed it very thoroughly. I have been doing some more research into using pallets for construction. Pallets are being thrown out all the time, and present a tempting source for free lumber. I always have a lot of projects on the go that require lumber, from potato towers, raised beds and cold frames to compost boxes, pallet gardens and frames to hold rain barrels. I'd recieved some information stating that pallets were safe for construction, and others saying they all were dangerous and treated with harmful chemicals. It turns out that some are okay to use while others aren't. Different pallets have different specs depending on what industry they are used as well. Pallets used in the food industry can be contaminated with e-coli 4 , but are probably still the most suitable to use. E-coli does not survive for very long outside of the gut of an animal, a matter of weeks to months, and you could easily keep pallets around for that length of time before having them be in contact with your finished produce. 5 Pallets that have been used to carry paint or hazardous chemicals might be avoided by the more careful. This is a guide with specs for pallets used for different industries 6. One might avoid pallets used for telecommunications/paint, drums, military/cement, automotive, drums/chemical, and Military 1/2. I want to be these people when I grow up. CFI plant forests and wildlife habitat in Africa and the Maritimes with the understanding that they are more likely to remain in place if they can also provide people with food, building materials and a living. The cost of eating local is at least partially offset by making changes like buying in bulk, direct ordering from farmers and cooking from scratch. Buy local as much as you can afford, and be sure your money is an investment in our foodshed of the future. Speerville's local products include: Red Fyfe flour, other wheat flours, pancake mix, Van Dyne dry beans, spelt, rye, oats, Maple products. Their other goods are organic but sourced from outside the Maritimes. Available at The Local Source, The storehouse, the Seaport Farmers' market and more! The Local Source (5783 Charles St Halifax),The Grainery (2385 Agricola St, Halifax), Homegrown Organics (6186 Allan St Halifax), the Old Brewery and Seaport markets, Tantallon market, Halifax Shopping Centre on Thursdays during the growing season, Dartmouth farmer's market, Local Jo's cafe (2959 Oxford St, Halifax), other farmers' markets. Sobeys and Superstore will usually label Atlantic grown produce seasonally. Tofu, veggie burgers, tofu slices, jerky, dips and spreads, veggie pate, pot pies, tofu turkey, okara sausage, okara bars and granola, baked goods. Available at Sobeys and Pete's Frootique, the Grainery, Home Grown Organics, Chester Organics, Mariposa Natural Market. Local seasonally pastured and grass fed meat and poultry can be found at the Storehouse (5544 Kaye Street), Halifax, the old Brewery and Seaport farmer's markets, Local Jo's, Charcuterie Ratinaud (2082 Gottingen), Flipburger (277 Lacewood), The Armview Restaurant (7156 Chebucto), The Wooden Monkey (1707 Grafton Street, Alderney landing) and more. Chadebucto trap caught shrimp are sustainably trapped close to the shore in the Strait of Canso. Available at Pete's Frootique and possibly other specialty fish stores. If not, ask for it! One of our largest producers are Cosman and Whidden, who can be found at the Halifax Seaport Farmers’ Market. Some other producers are Cornect Family Farm and Smeltzers, available at the Java Blend Cafe (6027 North Street Halifax) and Avery's markets. Dulse is a dry seaweed nutritional amendment and snack food, it is leathery and salty and surprisingly tasty. Get your dulse from www.fundydulse.com Or many shops and grocery stores around town. Available at the Local Source, Seaport Farmer's Market and Atlantic Superstore. A greater quantity and variety of greenhouse greens in the winter. Also, coffee, chocolate and cane sugar would be nice, but we'll take it one step at a time. --edit-- I've discovered today that Terra Beata also sells local dried apple and cranberry slices available at the Local Source. --edit-- I believe Covered Bridge chips are Maritime-made. An interesting corollary to this is that PEI so aggressively exports potatoes that these Maritime spuds crowd out local potatoes in other places, including Peru, where the breed originated. 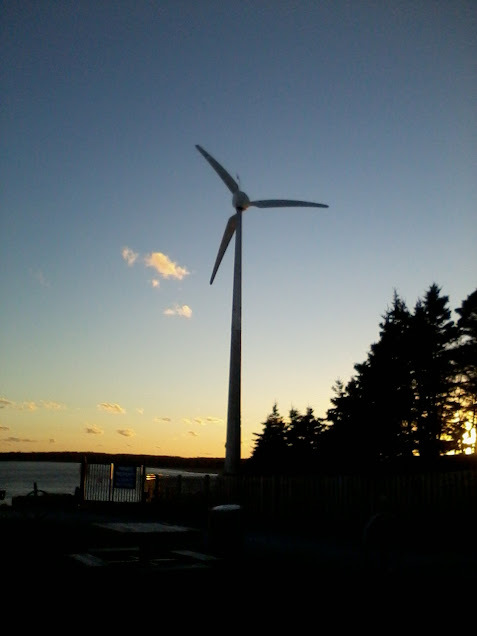 It finally looks winterish in Nova Scotia. In spite of a few very late very warm days into the double digits, we did have a white Christmas, and now the lakes are thickening up and it looks like we might even be able to skate on them this year. On my locavore diet I find I need to supplement my vitamin c with some orange juice a couple times a week. Greens are scarce, I failed to harvest dandelion roots before the ground froze to force grow in the dark in my basement. I am making do on cabbage, sprouts, kale chips and some pricy greenhouse greens and some imported things, as well as some peppers I froze earlier on. The frozen berries are long gone and I am into the jams and syrups. I am planning some cold frames to start spinach as early as possible in late February, after the day length is greater than 10 hours according to Niki Jabbour. My husband and I went away for the holiday to spend time with family. We both felt much healthier after returning to our diet of root-cellar local, seasonal and organic vegetables and dry goods: flour, rice and beans. Ah well, Christmas is also a time for excess! We are also thinking of ways to bolster the growing and house-heating power of our south-facing porch. It already heats the house a bit especially on sunny days but desperately needs to be insulated and have proper windows installed. These days I am building a rack which will hold bottles filled with water and painted black: thermal mass to capture solar heat and distribute it slowly throughout the night. The ultimate goal would be to have that room not freeze at night so we can grow plants in there year-round. Winter is a time for planning, reading, administering and building. Winter is also a time to build soil. The city is always fileld with the raw ingredients of compost: horse manure from the Bengal Lancers on Bell road, grinds chaff and burlap from cafes and coffee roasters, and right now, christmas trees. This is a pile of chopped up christmas tree in my backyard that I am hoping can eventually become mulch for the native garden beds I am planning for my front yard. Somerville enacts bylaws that make urban gardening, farming, chickens and bees legal. I wrote this blog post two weeks ago but never posted it. Following up on the Bulrush starch adventure, I proceeded to make more wild foods for my Sunday morning humanist group. This time I made blancmange, a pudding from irish moss seaweed, as well as 'elm food' from the inner bark of elm trees, and an attempt at marshmallows from the marshmallow plant. I cleaned and chopped the marshmallows, then boiled them in some water. I intended to make the marshmallows like merangues. The water did indeed come out very stringy and slimy like egg whites, but when I tried to whip them like egg whites they simply did not hold air. Perhaps I would have had better luck with an egg beater. Euell Gibbons had good results slicing the roots, boiling them, then frying them with some onion (Stalking the Healthful Herbs, 193). The seaweed and elm I boiled in milk, with added sugar. The irish moss gelled up nicely and ended up setting well. The elm stayed pretty liquid and was not pudding like at all. The general consensus was while they are all certainly healthy, the blancmange would have been even better with a touch of vanilla. One in our number works at a fast food restaurant, and we all pronounced the wild foods a good antidote or supplement to the fried diet. Yesterday I went to Cow Bay with the intention of gathering on Rainbow Haven beach but wound up instead discovering Silver Sands beach. I was there at about dusk and didn't stay long. The tide was fully in and the place was deserted. I found some shells of Jonah crabs, surf clams and blue mussels, and took home some bullrush roots. I gathered carageenan seaweed but lost track of my little pile of them and since I have plenty at home I did not gather more. The sprouts I've peeled and steamed. The outer leaf layers were fibrous and inedible but the core was sweet, potato-like and delicious. It was a bit fishy too but these were saltmarsh cattails. The roots I also peeled and rinsed in cold water. I cut the roots crosswize but this was not helpful ultimately. The starch really does rinse directly into the water and the fibers dissolve out. Cutting the roots just made for more little pieces to keep track of. I've dried out the starch on the stovetop because air-drying I think would cause it to go moldy. I think rendering starch for flour would be a waste of time and fuel. However it can be boiled down to a nourishing pudding-like substance that tastes sweet and breadlike and would probably make good papier mache. The yield was 1 part starch starting from 2 parts root, which for a wild food is pretty good. Cattails hold promise, at least until you can grow a first crop of wheat. As a biscuit. It looks very gluten-free. I rinsed some dulse in tapwater and am drying it in the oven and I will see how that goes. It's a familiar story. You didn't intend to grow potatoes in your garden but April came around and you were left with a bag of sprouted ones, pale necks yearning and straining towards life and you take pity on the potatoes and plant them. This time of year is like a second kind of Easter egg hunt. I put these ones in a raised bed that was filled with fresh Bengal Lancers horse manure. This is part of my project to fill my raised beds without buying soil. A lot of soil available for purchasing can come from questionable sources: slow-to-replace peat moss strip-mined from bogs, biosolids, or sometimes the topsoil from a bankrupted farmer's field. And there is no need to buy it, if you are able to sit tight for a year or two. Just look at this finished product after only one year! 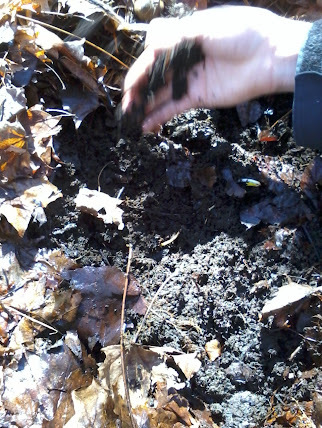 I eschewed the shovel and easily sifted through the raised bed with my hands. By the way, Bengal Lancers are always pleased to give manure away for free to anyone who asks nicely as they have to pay to have it removed. Of course I have no idea what variety these guys are, I think they were the tail end of the Ecology Action Centre root cellar project, so they were organic and purchased locally. These will tide me over until the next root cellar purchase and are going to go into some veggie pate. And yes, I dug up my potatoes in the dark. The shorter days are catching me by surprise. And I'm kind of a goth, ok? I want to see a side-by-side trial of raised beds filled with mulch and potato towers, to see if the potatoes planted into a tower that is already filled burrow down all the way and make just as many tubers as the potato that has mulch piled around it higher and higher all year. the news reports say we might get rain today but after several false alarms in the last six weeks or so since it last rained, I am being cautious. Every morning this week I've gone outside and picked a pint of raspberries for my breakfast. My berry bushes are going berzerk, and so are the ones in the wild. This is a combination of the fact that I fertilize them a little more than the average bear (finished compost, several times a season) and the fact that they are under stress from the drought, preparing to send forth as many seeds as possible in case they don't make it. A tiny scrap of genetic instructions, some food, maybe some compounds to fend off invaders, but that's all, and the seed is off, to lie in the soil and wait, sometimes for decades. I am continuing my project of recording how much water we use in my household per month. I'm afraid that since I've had to resort to irrigating my beds, the numbers will be off the chart. The container gardens in particular require a lot of water, almost every day. I have a lot of container gardens because they make use of some of my enormous driveway. I always save the cookwater from potatoes, pasta or beans for my garden but now I've started to save greywater from doing my dishes too. It is an incentive to use less of it when one has to carry it all to the garden several times a day! I read an aricle in the Cape Breton post on Sunday that got me thinking. The article reported on a lack of harvesting workers in Prince Edward Island, and that farmers were downgrading the size of their fields to account for the food going to waste. The article (I will try to get the title) goes on to interview a farmer who says that people have no ambition today and that he knew of some children who made $400-$700 a week picking strawberries. This comment is made at a time as an announcement that people on employment assistance will have to take picking and harvesting jobs to continue benefits. Is this how we are going to make these jobs attractive? By saying that they are for children and those on benefits? In my opintion it continues the negetive public attitude toward farmers and producers which I suspect have been handed down since feudal times; that the only ones growing food are those who are of too low social status to find an alternative. Traditionally the province of migrant, possibly unpapered workers, picking was relegated to the status of virtual slavery in James Howard Kunstlers dystopic novel, World Made by Hand. Can I propose that picking be elevated from the work of serfs to a civic duty? That's our food going to waste. Saving it is an honourable thing. Perhaps if we all were expected to help out for one weekend of the year this wouldn't be an issue. And maybe our kids would learn a little something about local food on the way. As we enter into the harvest season things are not slowing down! I will next post an entry I wrote a month ago and neglected to post! In the meantime, my two zucchini plants are producing as much as my house hold can handle. I am not going to plant more than two a year ever again unless circumstances change dramatically! "This wasp thrusts its ovipositor into soil to detect a grub larva, lays one egg on each. The wasp larva burrows into the beetle larva, killing it, then scavenges remains and pupates there in soil." I have put in my autumn planting: arugula, black seeded Simpson lettuce, Bloomsdale spinach, Bright Lights swiss chard, and some beets. I seeded the Occu-pee with white clover as a green manure. As are the potatoes: they were a good use of not-quite-finished compost in these raised beds. Do you ever wonder, "what the heck is permaculture anyway?"? I am giving a workshop tomorrow (August 23) and the Thursday after, August 30 at Just Us cafe on Spring Garden road at 7:00 pm titled What Is Permaculture. Admission is free. Tell your friends. The common Roots Urban Farm had it's launching work party day today. The raised beds to the east side are for community groups, and there are a half-dozen or so that are for public consumption (the ones closest to Robie street). Jayme Melrose said she figured about 200 volunteers attended today. Councilor Jennifer Watts made an appearance. As cute and humongous as this critter was, if my neighbours saw a raccoon going through my compost they would crucify me. So I was inspired to finally (nearly) finish this humanure hacienca or, as I call it, the over-engineered compost box. It has a flipping lid on hinges, a locking front door on hinges, and is made of solid hemlock. It was rather expensive to make. Its future buddy compost box is going to be a much less accessorised $40 spruce box from Penny Lane work experience and assisted living for the mentally challenged in Bridgewater. More pictures from my garden. It's time for another garden update. I've been harvesting salads of arugula, spinach, radishes and lettuce for a couple of weeks now. A lettuce that I grew from the root ball of a hydroponic lettuce bought at the grocery store. The Ecology Action Centre root cellar discharged and I cleared out the last of my produce last week. Much of it went to Food Not Bombs. Of the remaining 10 pounds of beets, I will probably pickle and can them. The first 2012 Fruit Tree Planting Day (and the second ever Halifax fruit tree planting day of all time) took place Mother's Day. We distributed more than fourty fruit trees in Metro, and I'll get some photos up as soon as I can. One of two hazelnut shrubs I ordered.